I am not a popular culture kind of guy–indeed, I gave up on rock & roll when The Beatles broke up. Back in the 80's when friends tried to tell me about The Talking Heads I just couldn't see what the hullabaloo was about. If I have a popular culture "handicap" it must have something to do with the fact that I turned away from packaged entertainment in my sophomore year of college when I began reading Duns Scotus in earnest and Ernest Dowson for kicks. I swear I'm not a snob. If you are hooked on Lady Gaga I'm with you, at least in spirit. But my pop culture index was frozen long ago back when the Dodge Dart was the best selling family sedan and "The Rockford Files" was the most popular crime drama on American TV. I checked out a couple of episodes from 1973 on Netflix the other night. 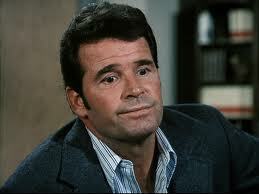 James Garner's admixture of irreverence, self-deprecation, ironic toughness, fair mindedness, and working class values made me happy. "God Almighty," I thought. "How much we've lost as a culture." Garner's Jim Rockford is both Sancho Panza and Quixote–picaresque, imbued with comic irony, by turns sane and foolish. Of course the car chase scenes are goofy, lots of driving in the desert outside of L.A. with obligatory dust and a gold Camaro. The dialogue is by turns the stuff of Raymond Chandler and Gunsmoke. The scenes are slow to develop. The fight sequences are stagy and hopeless. If you want to tune out contemporary and endless "noir" and you're willing to put up with bad 70's fashion you'll have a good time revisiting these old episodes–I swear. Or you won't. Either way it's of no import. Isn't it nice? In this instance I have no intention of saving anyone. I'll let Jim rockford do it. I make no excuses for my eternal love of The Rockford Files.